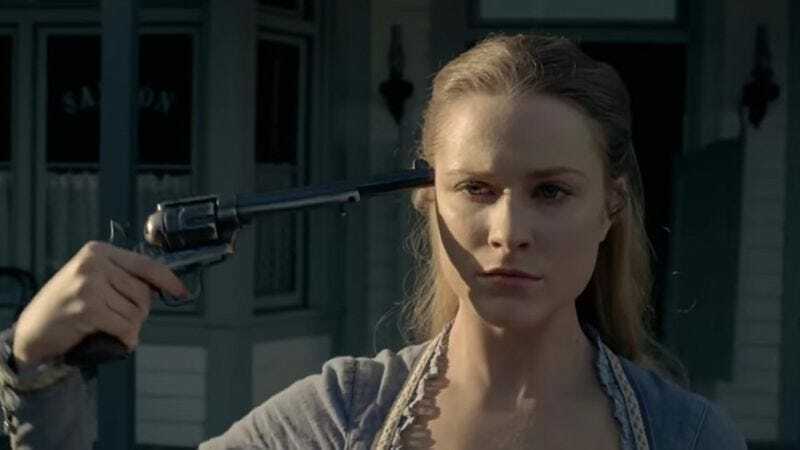 Do you believe in life after Westworld? Here’s what’s up in the world of TV for Sunday, December 4. All times are Eastern. Once Upon A Time (ABC, 8 p.m.): Once Upon A Time is using its sixth-season fall finale to send you all the message “Wish You Were Here.” Who, specifically? Let’s really break this one down, shall we? “When she learns that our heroes possess a weapon capable of defeating her, the Evil Queen steals Aladdin’s magic lamp from Jasmine and makes a wish that could sideline the Savior forever.” It might be safe to assume the episode title has something to do with this plot, but Gwen Ihnat’s discussion post should be able to tell one way or another. Also: On a scale of one to Cuckoo’s Nest, how insane is this episode synopsis to people who don’t watch this show? Dinner At Tiffani’s (Cooking Channel, 8 p.m.): It’s “Christmas At Tiffani’s” in this “special presentation.” And besides the Christmas aspect of it all, what makes this so special? Kelly Kapowsi and Zack Morris reunite! Yes, Mark-Paul Gosselaar is having Dinner At Tiffani’s—and so are Tiffani Thiessen’s White Collar husband Tim DeKay and her Beverly Hills, 90210 co-star Jason Priestley. As usual, no word yet on whether or not Bill Bellamy will show up. Westworld (HBO, 9 p.m.): Westworld’s first season is coming to an end, so after this, you won’t have weekly episodes to use as an excuse for your most recent theories and questions about the show. Because we know you have so many theories and questions. This 90-minute season finale, “The Bicameral Mind,” supposedly has the answers to said theories and questions, but the episode synopsis keeps it all just vague enough: “Ford unveils his bold new narrative; Dolores embraces her identity; Maeve sets her plan in motion.” Zack Handlen may not have all the answers right now, but we’re sure he’ll do his best in his review. Killer Whales: The Mega Hunt (Animal Planet, 6 p.m.): “Five thousand dolphins are for dinner in this never-before-seen feeding frenzy.” Well. That’s horrifying. Good thing it’s on early, so you don’t end your Sunday with this nightmare fuel. Looks Like Christmas (Hallmark Channel, 8 p.m.)/Hearts Of Christmas (Hallmark Movies & Mysteries, 9 p.m.): On one Hallmark network, you’ve got Anne Heche and Dylan Neal. On the other, it’s Emilie Ullerup, Sharon Lawrence, and Kristoffer Polaha. Only one of these actors was in an episode of television titled “What Are You Doing Here, Ho-Bag?” There you go. Anthony Bourdain: Parts Unknown (CNN, 9 p.m.): The eighth season of Parts Unknown ends with one of the more obscure places in the world: Rome. You probably haven’t heard of it. The Royals (E!, 10 p.m.): Queen Elizabeth Hurley is back with the third-season premiere of The Royals. Continuing where the second season ended, “Prince Robert is revealed to be alive, but whether he is well is still to be determined.” Dun-dun-dun! Pearl Harbor: The Truth (History Channel, 10 p.m.): The “truth” about Pearl Harbor? What do we need this for? We have Michael Bay. We suppose that’s the hook for this: See what the so-called History Channel can possibly teach you that can’t be learned in a Ben Affleck-Josh Hartnett blockbuster. The Twilight Zone, “Kick The Can” (Amazon Video/Hulu/iTunes/Netflix/Vudu): W. Kamau Bell isn’t the only one reaching the fountain of youth tonight. Step into the Twilight Zone, just this once, for young time’s sake.